Fine. But does that deny that an author has in her mind, when she writes, some meaning she intends to convey to her readers? Can readers misinterpret those meanings? If I had read How To Get Filthy Rich In Rising Asia as a guide to getting on in the world, and not as, in part, a commentary on both guides to getting on in the world, and also the whole idea of getting on in the world, would Mohsin Hamid have had a right to irritation? How interesting you find such questions will probably partly determine how much you enjoy How To Get Filthy Rich In Rising Asia, as will how you feel about the fact that Hamid asks you, the reader, to participate in his novel as “you”, his unnamed main character, even though you are no freer to invent “your” biography than you are to interpret How To Get Filthy Rich In Rising Asia as a self-help book, since Hamid has done (most of) the inventing for you. On the financial side, you scam, cheat, bribe, and batter your way to riches. In old age you yourself are cheated, and you descend from the top of the money tree somewhere back towards its middle. How To Get Filthy Rich In Rising Asia is challenging, playful, serious, knowing, argumentative, upsetting and wonderful. It’s political, angry about the conditions of the world’s poor, and it’s deft and touching in its treatment of the personal. It’s filled with sentences that demand rereading, as does the whole novel. I loved it. 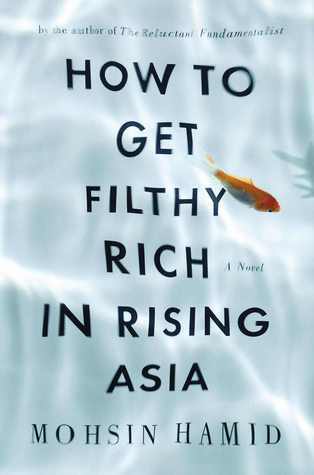 How To Get Filthy Rich In Rising Asia is published in the US by Riverhead Books, and in the UK by Hamish Hamilton. Depending where you are, you will probably find both editions available in Asia – though of course more readily available in risen Asia, than in either rising Asia, or in sinking Asia. It is available as an e-book. If you have read How To Get Filthy Rich In Rising Asia, please post with your opinions.